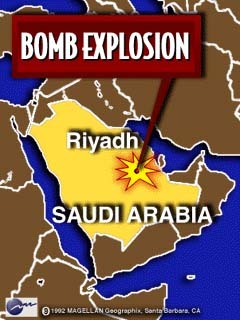 WASHINGTON (CNN) -- An apparent car-bomb explosion outside a U.S. training facility in Riyadh, Saudi Arabia Monday killed six people, including five Americans, and injured about 60 others. Thirty-four of the wounded were Americans; one of the Americans killed was an enlisted U.S. soldier. The other four were civilians. The explosions -- two, about five minutes apart -- ripped the front facade off a building where nearly 400 Americans train the Saudi National Guard to use weapons bought from the U.S. Authorities believe a bomb was concealed in a van parked near a ground-floor snack bar where both Americans and Saudis were having lunch. 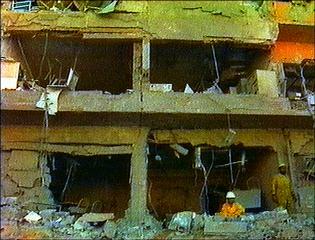 President Clinton said that efforts were under way to find who was responsible. "We have expressed our condolences and deep regret to the families of those who were killed and we have already begun the process of determining what happened," he said. U.S. officials said that two groups have claimed responsibility for the attack : Tigers of the Gulf, which has never been heard from before, and the Islamic Movement for Change, an extremist group that advocates a complete break in Saudi-U.S. relations. The Saudi government has come under increasing pressure from militant Islamic religious groups who are unhappy with the Royal Family's strong ties with the U.S., as well as its quiet support for the Middle East peace process. For that reason, neither the Pentagon nor the Saudi government publicly acknowledges the more than 100 U.S. Air Force planes based in Saudi Arabia that patrol Iraq's southern no-fly zone. And the kingdom refused to allow the U.S. to store tanks and military equipment on Saudi soil. "The issue of American troops is as discreet as possible, as low key as possible, and that characterizes the relationship as a whole," said former U.S. ambassador to Saudi Arabia Richard Murphy. 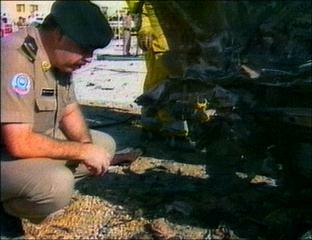 The building targeted by the bomb was headquarters for a $5.6 billion multi-year program to help the Saudi military be better prepared to defend the country -- one of several Pentagon projects accelerated after the Persian Gulf War. The U.S. insists it will not cut back its military profile in the wake of Monday's terrorist attack. Security is being increased at U.S. facilities in Saudi Arabia, and the United States is dispatching a special team of FBI agents to help investigate the bombing -- the first terrorist attack against the U.S. military in Saudi Arabia in half a century. If members of your family are Defense Department personnel working in Saudi Arabia, call (703) 274-8013 beginning at 7:30 a.m. EST Tuesday. For questions about family members or friends who are private U.S. citizens, call (202) 647-5225. Saudi Arabia dissension behind attack?